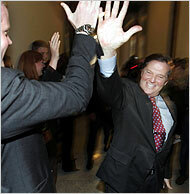 TommyWonk: Why Is Tom DeLay Smiling? Yeah, just "winning" or "losing". "My loyalty to the Republican Party ? indeed, my love for the Republican Party ? has played no small part in this decision." NOT love for the American people but for the Republican Party. Don't move or the puppy gets it. Running Windows on Macs? But Why?